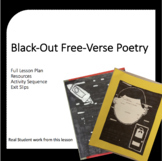 Poetry Lesson Plan: Black Out Free Verse Poetry Full lesson plan, including exit slips, differentiation, activity sequence, resources (newspaper, old books, or magazine required). Real student work featured in preview! Analyzing Poetry Lesson Plan with EXTRAS!!! 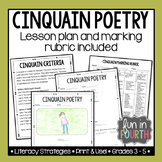 This is a poetry lesson plan that includes the objectives, vocabulary and rubric for analyzing poetry (Comparing & Contrasting) Suggestion: you can use a graphic organizer with this activity. 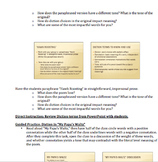 This is a lesson plan free verse poetry and the bell ringer worksheet. The activity as students use magazines and newspapers to create their own free verse poetry about themselves. The common core standards addressed are listed on the lesson plan. This lesson plan, based on Kate DiCamillo's book Because of Winn-Dixie, allows students to discover descriptive language. At the end of the lesson, they will create a found poem. 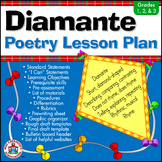 Here are 12 poetry lesson plans and teaching points that can be used in 1st grade. Some TPs are taken out of the 2nd grade Teacher's College Poetry Unit and modified to fit into 1st grade. Full lesson plan aligned to 6th grade ELA common core standards. I used this as a Demo lesson for a job interview and got the job! I hope this helps. The lesson plan can be viewed by downloading the Preview File. 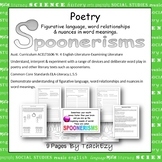 The slide show that accompanies the lesson plan can be purchased if you like the lesson plan. I have taught this plan for two years so far. Please read the lesson plan to see everything that is included in this package. Golden Shovel Poetry Lesson Plan - Based on Jean Toomer's "As the Eagle Soars"